Should it have been awarded? Bath secured a much needed 37-32 bonus-point win over Harlequins at the Stoop yesterday afternoon, but Paul Gustard’s men came away with two bonus-points themselves that could be crucial come the end of the season. Things could have panned out a lot differently however, had a Chris Cook try not have been disallowed with 71 minutes on the clock, and Bath leading 37-18. 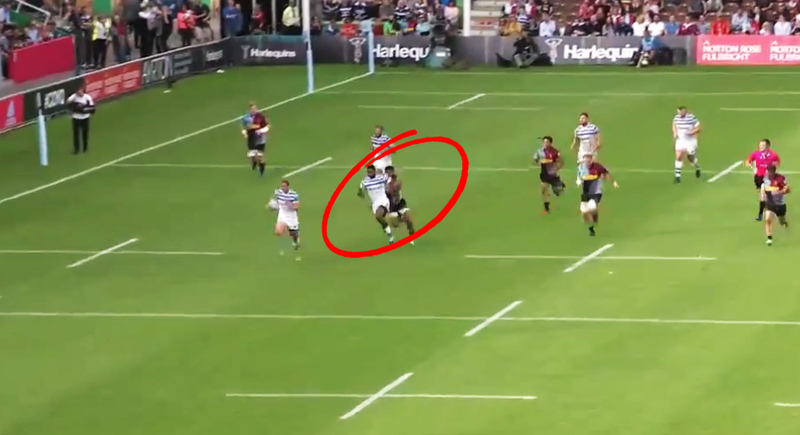 Jamie Roberts blocked a Quins pass, allowing Cook to intercept and break away up the pitch, with a clean run ahead of him straight to the posts. But on second viewing, it was judged that teammate Aled Brew blocked Quins from making the tackle. John Cooney did something similar for Craig Gilroy last week, helping his Ulster teammate score an incredible solo-try. Can you support your teammate any way you want? Or is it obstruction if you block a tackler? The argument against Cook’s try seems to be yes you can support the ball carrier any way you want, but Brew does not do this, instead he ‘blatantly’ changes his line to obstruct the tackler. But were Quins ever in a position to catch Cook? To make matters even worse, Cook had already taken an attempted drop-goal conversion before the TMO was called into play. Does that not mean it’s too late to go to the TMO and the try should have stood? Have a look below and decide for yourself. Can he support his teammate how he wants? Is it obstruction of a defender?